I have a confession, I’m a perfectionist. I hate it when I try something new and it doesn’t turn out. In the past I have let this fear hold me back, but I’m doing my best to get over it. Then the night of the ‘Lemon Cake Pie’ came, and it made me want to give into my perfectionism and only cook or bake things that I KNOW will turn out wonderfully. I did not make my own crust, used the Pillsbury ready crust instead. I made this recipe two nights in a row. Burnt and gooey? Takes talent to make that happen. The second night I was on my own and determined to make this thing work. I beat the egg whites to a frenzy. I kept the milk and lemon juice separate until everything was ready to be mixed together. I used a glass pan, just like the picture. I tented with foil early on, so nothing would be burnt. I tired to correct any mistakes we may have made the night before. It’s a whole lot prettier than the night before – BUT – it still just wouldn’t set up. After about 45/50 minutes, I cried “Uncle” and pulled it out of the oven to cool. To prepare the crust: In a food processor or with a pastry blender, mix flour and shortening until mixture is the consistency of cornmeal, about 10 pulses. Add 1/3 to 1/2 cup ice water to form dough. Divide dough in half. On a floured surface roll one half into a 12 inch circle and line a 9 inch pie pan; chill in refrigerator. Freeze remaining dough for later use. Heat oven to 450 degrees with wire rack in the lower third. Stir together flour, sugar, butter zest, lemon juice, egg yolks and milk. In a separate bowl beat egg whites to stiff peaks and fold into lemon mixture. Pour mixture into crust and bake 10 min. Reduce oven to 350 degrees and bake until a knife inserted comes out clean, about 30 minutes. If top of pie gets too dark, tent with foil. The first night, we all took a spoon to the middle, just to get a taste. It was TART (lip puckering tart). The second night, the taste was much milder. But in the end, the thought of cake and pie having a happy yummy marriage is much sweeter than the actual result. I’m going to keep trying new things, but this recipe will be put in the ‘Do NOT attempt again’ file. A few weeks ago as husband and I were out wandering, I was hoping we’d come across a local coffee shop for some pie. Unfortunately we were out in the middle of nowhere so there was no pie to be found. The recipe is from the Food Network Magazine, November 2011 “50 Pies” supplemental. I did not make the crust, I used the pre-made crust from Kroger. Peel and core the apples; slice 1/4 inch think. Toss with the sugar and lemon juice. Heat 4 tblsp butter in a large skillet over med-high heat. Add the apples and cook, stirring, until tender, about 10 minutes. Stir in the flour, cinnamon and salt; cook until thickened, 1 more minute. Let cool. Roll out 1 disk of dough into a 12-inch round on a floured surface; ease into a 9 inch pie plate. Add the apples, mounding them slightly in the center, and dot with the remaining 2 tlbsp of butter. Roll out the remaining dough into a 12-inch round. Lay it over the filling, press the edges of the crusts together, then fold the overhang under itself and crimp to seal. Brush with the beaten egg and sprinkle with coarse sugar. Cut a few slits in the top crust. Chill 1 hour. Place a baking sheet on the lowest oven rack and preheat to 425 for 30 minutes. Place the pie on the hot baking sheet; lower the temp to 375. Bake until golden, 1 hour to 1 hour 10 min. (Cover the edges with foil if they brown too quickly.) Cool on a rack. 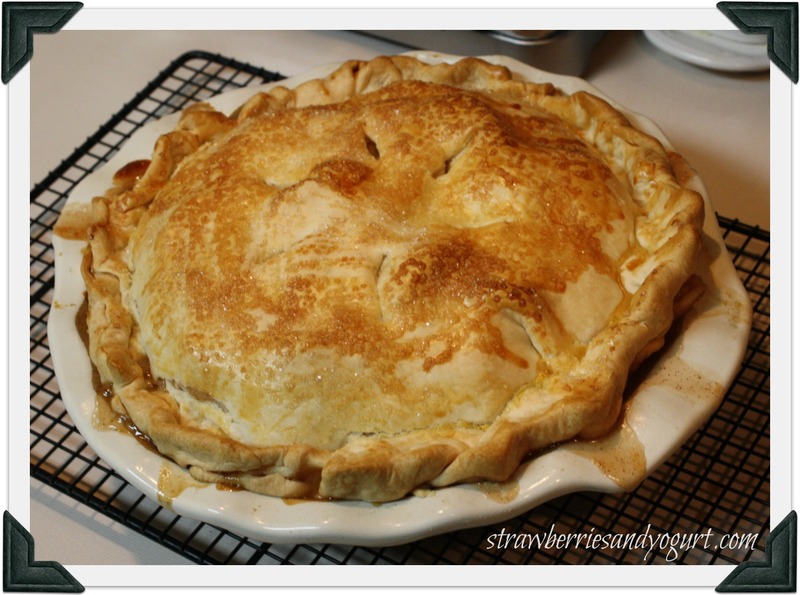 While this wasn’t my mom’s apple pie, it was a very close second, this recipe will definitely be used again. Next time I might even try my hand at a homemade crust.